There is no higher level of satisfaction, than from reading positive feedback from buyers and sellers just like you! Read some of my testimonials. I hope you enjoy reading them as much as I do. “We just want to take the time to thank you for the job well done Dan! Through the trying times you remained calm and positive. We have worked with a lot of real estate agents and you provide a great service. We would like to say you have been our favorite agent to work with yet! Through your hard work and determination you got us a great deal. We will recommend you to all our family and friends." “I highly recommend, Dan Veselic, realtor of RE/MAX of Golden. Dan's commitment to listen and enact upon his client's requests is excellent. When you have questions, comments or concerns, Dan is highly supportive and responsive with a viable solution in "real time". I am a firm believer that there is a buyer for everything that is for sale. Dan's dedication to servicing your needs, no matter how great or small, is a testament to this belief too. Honesty and hard working values are always shown. Dan represents himself well and as in his genuine interest in those clients that he represents too. Dan came recommended to me on the positive words of a Golden community member. He got the results as I heard from others that he would. If you are loking for the best realtor in Golden, BC, I would recommend the best person for the job--that would certainly be Dan Veselic." “Dan is great, he is a very knowledgeable and courteous realator who went above and beyond for us. We were very unsure of what exactly we wanted to get into and he was very informative and patient with us, showing us a couple of properties many times and being prepared with answers to all of our questions. We really had the feeling that he was working with us to help us find a home and really appreciate his hard work and patience and are very happy with our new place! Thank you!" We would like to take this time to thank you for your extraordinary efforts on the sale of our home. Your professionalism, dedication and optimism was much appreciated in what could be a very stressful time. Contractual negotiations over long distances are generally quite fatiguing, with you however it was a pleasure. Thank you so much for your hard work, we will certainly refer our friends and family your way in the future." 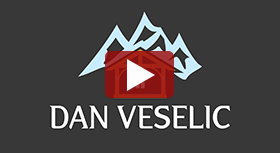 "On our recent purchase in Golden BC, we would like to thank Dan for his expert advice and help throughout the whole process of our purchase and move into our new home. Our family would not hesitate in reccomending Dan to help buyers to use his advice on home purchases in the future. Thanks again, Dan!" "Thank you for helping me find my first home, Dan! I was very impressed with how well you explained the home buying process. You kept me completely informed right up until completion, and communication was smooth from start to finish. You were always honest, and handled the entire transaction with control and confidence. For one of the younger, up-and-coming Realtors in Golden, your business sense shines, and I reccomend you with confidence!" "Thank you, Dan, for handling the sale of my home with such dedication and effort. Right from the get-go, Dan was very quick, dependable and fully committed. Dan always returned calls and texts when I had questions or concerns, and I could depend on him at any point in the transaction. Most importantly, Dan coached me, offering tips in how to present my home. In the end, everything came together in a timely fashion and I achieved a sales outcome that exceeded my expectations. A HUGE high-five to you, Dan!" “We really appreciated your relaxed, client-first approach and the fact that no request seemed to be too much trouble. Because we were moving from another province, we especially appreciated your help in all areas of the transaction, from lining up all the viewings, the home inspector, well testing company, and real estate lawyer. We are very satisfied with all the people you recommended; the process went smoothly, without a hitch. You are fun person to be around and we really enjoyed house hunting with you; you really did put our interests first. We also appreciate the fact that you took an interest in us personally as well.